CUERVO 1800 clear glass bottle decanter with cork end stopper. Vintage Italian soda bottle or decanter shaped drinking vessel in white ceramic with toggle closure sign on the bottom. Ducks Unlimited Wings Across the Continent empty porcelain jar Old Cabin Still 1972 decanter. Woodpeckers 1969 set of two porcelain decanters from James B. Beam Co. Bourbon Whiskey by C. Miller. 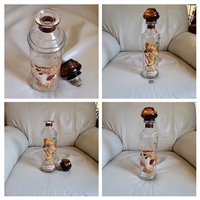 Leather wrapped Liquor bottle with Golf theme decorations, whisky decanter. 1000 ml. Vintage Italian leather bound green glass nautical theme bottle with sailing ships decor, 1 Liter. Jolly Mountaineer Decanter by Indiana Glass through TIARA in electric blue clear glass. Delft Blue Holland set of two BOLS bottles or jugs with floral and windmill accents. Elegant vintage glass decanter 1960 in pressed glass leaves and vines design with fleur de lis topper. Retro style glass bottles with huge stoppers. Hunting theme decals with ducks and dogs. An Artiso Craft Creation of Aesthetic Specialties 1903 Cadillac Amaretto car automobile decanter made in 1997. Vintage etched glass decanter in uniquer slim design, 16-1/4" tall. Italian Claret Jug in high polished metal with gold color medallions and laurel leaf design and glass center decanter. Amazing cream color empty decanter bottle Paul Bunyan from Americana Collection J.W.Dant's Kentucky Straight bourbon Whisky. Old Grand-Dad Bourbon bottle decanter, Bicentennial edition. Vintage metal automobile car decanter Royal Crest alike accent with Amber cut glass carafe bottle container made in Japan. Embossed glass with etched design footed decanter with stopper early 20th century.